Launched: 29 November 2002. Last updated: 22 February 2011. Some instituitional collections of Antarcticana are very well-known, Scott Polar Research Institute in Cambridge and New Zealand's Canterbury Museum, for example. Others are unexpected or found in unlikely places. Included below are some of the latter. The Catalogue of The Library of the Antarctic Circle, Jaffrey, NH. Antipodean Books offers up a big collection. Australian Antarctic Division - Books in Special Collections. Hobart, Tasmania. Byrd Polar Research Center Archival Program, The Ohio State University, Columbus, Ohio. Canterbury Museum. Christchurch, New Zealand. Plymouth City Museum and Art Gallery, Plymouth, Devon, UK. The Archives of the Scott Polar Research Institute, Cambridge, UK. "Freeze Frame," Scott Polar Research Institute, Cambridge, UK. The Griffith Taylor Collection, University of New England, Armidale, N.S.W., Australia. 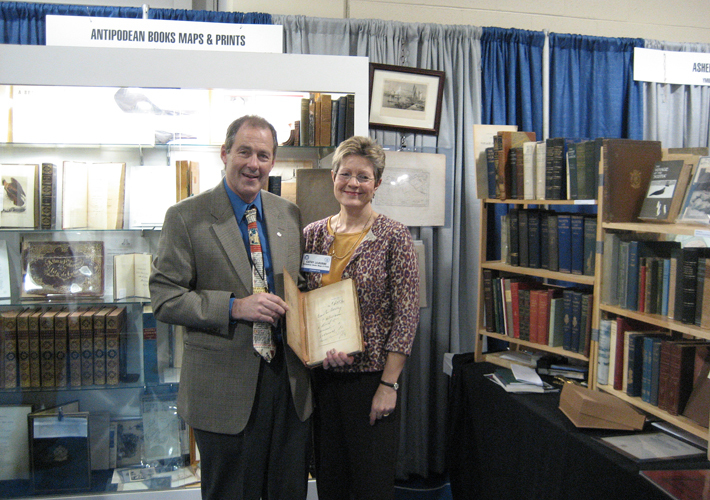 At the Boston Antiquarian Book Fair this past Friday (14 November 2008), David and Cathy Lilburne (Antipodean Books) featured an Antarctic collection that is both extensive and impressive. It was developed by collector Michael Shuman and is now for sale through Antipodean Books for an asking price of $350,000. The highpoint is a very nice copy of the Aurora Australis but most every important title that deserves to be in an Antarctic collection is included as well. The Antarctic Circle shies away from anything of a commercial nature but in this instance it seems appropriate to make known the availability of a collection of note. To view a description and listing of the collection (pdf) click here. David and Cathy holding the Aurora Australis at the recent Boston Book Fair. Some but by means not all of the collection is arrayed behind them. "In 1996, the Bradford Swan Antarctic Collection was transferred from the John Carter Brown Library to the John Hay. The 225 titles in the original donation have now been catalogued, and in the four years that Antarctic exploration has been a collecting interest of the John Hay, 150 titles have been purchased to supplement Mr. Swan's original collection and to provide reference materials for researchers using the Antarctic materials." --From the Hay Library Webpage. "The John Hay Library houses most of the University's rare books, manuscripts, special collections and archives." Bradford F. Swan (1907-1976) was the theater/arts critic of the Providence Journal-Bulletin ". . . and for decades one of Rhode Island's most prominent arbiters of taste in the arts. . . . [His] professional career and private life was marked by a wide range of acquired interests which he pursued with devotion until his death. These included painting, theater, the dance, mountain climbing, botany, book collecting, historical research, fine food and wine." He was a member of the American Alpine Club and was the editor of Appalachia, the journal of the Appalachian Mountain Club. "During his college years, Mr. Swan became a book collector and took great interest in H. L. Mencken. Mr. Swan formed the first important collection of Mencken's works and maintained a correspondence with the writer until Mencken's death. Mr. Swan later contributed the collection to Yale. Among his gifts to the John Carter Brown Library was a collection of books on Antarctica, which he had visited and in which he retained a lifelong interest. He also presented many rare editions of the Bay Psalm Book to the Library. . . . He was the author of a number of historical scholarly works, including 'New Bedford in 1827: the Missing Diary of Samuel Rodman,' 'Captain Alexander Winsor,' 'A Bibliography of Henry Blake Fuller,' 'Gregory Dexter, London Printer,' 'Auctioning Alice' and 'The Ruysch Map of the World, 1507-1508.' A former president of the Rhode Island Historical Society and the Providence Art Club, he was a trustee of the Yale Library Associates, and a member of the American Antiquarian Society, the Bibliographical Society in London, the Bibliographical Society of America, John Carter Brown Library Associates and Friends of the Brown University Library." --Largely from an obituary that appeared in the February 25, 1976 issue of The Evening Bulletin. Atlas Antarctiki. Leningrad, 1966-69. 2 vols. 2 archival boxes containing National Science Foundation and U. S. Naval Support Force, Antarctica news releases on various topics; Operation Deepfreeze. 2 archival boxes of U.S. Navy official Antarctic photographs. Antarctica souvenir photo book belonging to Bradford Swan. 1 archival box "Misc. Uncat." "The John Carter Brown Library is an independently funded and administered center for advanced research in history and the humanities, at Brown University." It "...contains one of the outstanding collections in the world on the history of the Americas, both North and South, published prior to about 1825. Among the some 50,000 volumes are numerous books and pamphlets describing the growth of the European colonies in the New World and the impact of discovery and exploration of the New World upon Europe." 1. CLAUDIUS PTOLEMAEUS. Geographia. Manuscript atlas. c. 1450. The last map of the Brown-Wilczekianus Codex is a map of the southern half of Africa. Whereas most Ptolemaic maps of the pre-Columbian period show the Indian Ocean as a lake with Africa joined to India in one land mass, this exceptional map indicates the possibility of sea to the south of Africa. 2. HENRICUS GLAREANUS. De Gaeometriae principiis ad sphaerae astronomica noticiam necessaris - Manuscript, before 1520. The polar projection maps drawn by the Swiss geographer Glareanus are exceptionally early maps of this type and represent an unusual and creative geographical idea for his time. In the absence of further information the south polar area has been left blank on this map. 3. BAPTISTA AGNESE. [An atlas of Portolan charts.] Manuscript [c. 1543- 45]. This manuscript atlas shows the track of Magellan's voyage around the world. The passage around South America was made through a narrow body of water and only land could be seen to the south. This gave rise to the belief that the Strait of Magellan was the only gap between two large land masses. 4. ROBERT RECORDE. The Castle of Knowledge. London, 1556. The book represents the best early thinking about the Antarctic. Although nothing was known of the area, the assumption was made that the Arctic region had to be balanced by an opposite or Ant-arctic region. "The Antartike circle is equall and equidistant to the Arctike circle, and toucheth the Horizonte in one only point, and is all vnder grounde, and all the starres that be in it, are euer more out of our sighte." Florianus shows here the Southern Continent south of the Strait of Magellan without any descriptive legends, indicating some uncertainty in his mind concerning the inaccessible land to the south. Early in his distinguished career Gerhard Mercator published his map of the world on a double cordiform projection, showing the Southern Continent with a conservative note as to the uncertainty of its extent. Shown here is a copy by Antonio Salamanca, published about 1560. 7. GIACOMO GASTALDI. Cosmographia. Vniversalis. Venice, 1569. The imaginary Southern Continent of the sixteenth-century cosmographers appears on many Italian maps of the period. The oval projection of this map shows the concept clearly and impressively. 8. PETER MARTYR. De Orbe Novo. Paris, 1587. The first map which shows the impact of Drake's voyage on geographical knowledge is the one by an unknown cartographer (using, apparently, a Spanish model) contained in this edition of the famous Decades prepared by Richard Hakluyt. Note the reference to Nova Albion (i.e. California) and the first indication of what we now call Drake Passage between Tierra del Fuego and Antarctica. 9. The famous voyage of Sir Francis Drake into the South Sea, and there henceabout the whole Globe of the Earth. Drake sailed south of Tierra del Fuego in making his circumnavigation. By doing this he established that a large body of water lay to the south of the American continent. This water, now called the Drake Passage, was first described in print in Drake's account of his circumnavigation, first inserted in most copies of Hakluyt's Principall Navigations, in 1589. This single cordiform projection is one of a number of maps based on a woodcut by the French geographer and mathematician Oronce Fine. The Southern Continent is here said to have been recently discovered but "not yet fully examined." Bishop Hall's satire on European manners was placed in the Antarctic. Here, in the vein of Utopia and Gulliver's Travels, one finds "Drink-allia" and "Eat-allia" and "Gossipia" where the women live. New lands were discovered so regularly in the 16th century that an inhabited southern continent would have been no surprise. "... and finde this: Terra Australis, nondum Cognita. The unknowne Southerne Continent. What good spirit but would greeue at this? If they know it for a Continent, and for a Southerne Continent, why then doe they call it unknowne?" 12. PEDRO FERNANDEZ DE QUIROS. Terra Australis incognita. London, 1617. Fernandez de Quiros was the first person to search for the Southern Continent. He sailed to the New Hebrides on one voyage but when he tried to obtain funds for another voyage he was refused. Of his fifty petitions for money only this one was printed and translated into English. It helped perpetuate the myth of the Southern Continent. 13. [HENRY NEVILLE]. The Isle of Pines, Or A late Discovery of a fourth Island. London, 1668. Neville was a political writer and he, like Hall before him, used the mythical continent as the setting for his tale. 14. Relation D'Un Voyage Du Pole Arctique Au Pole Antarctique. Paris, 1723. First published in Amsterdam in 1721, this book is pure science fiction. The author purports to have tipped his boat at the North Pole and sailed through the center of the earth to the South Pole. 15. PHILIPPE BUACHE, Carte des Terres Australes... Paris, 1739 [revised 1754]. Published under the auspices of the French Académie des Sciences, this map by the famous geographer Philippe Buache shows the routes of various expeditions into the Southern Hemisphere beginning with Magellan and including that of Bouvet de Lozier in 1738. A later hand has added (in black ink) the route of Cook's southern voyage. The map is of interest as a summary of mid- eighteenth-century knowledge as well as an indication of the questions which scientists were asking at the time about the Southern Continent and of theories which were taking shape in their minds. 16. JAMES COOK. A Second Voyage Round The World In the Years MDCCLXXII, LXXIII, LXXIV, LXXV. London, 1776. Alexander Dalrymple was sure that there was a habitable southern continent. He had hoped to turn the British Transit of Venus expedition of 1769 to Tahiti into a chance to prove his thesis. Unsuccessful in this, he badgered the Admiralty until they sent Cook out in the "Resolution" to silence him. Cook sailed around the Antarctic, crossing the Antarctic circle several times, and ended the myth of the Southern Continent. "December 19. . . . At 6, P.M. Crossed The Antarctic Circle. Sun the whole day." 17. JAMES COOK. A Voyage Towards The South Pole. 4th edition. London, 1784. Cook established the limits within which any southern continent must lie. He guessed from the nature of the ice floes that they came from land, but thought that the land would be too cold for human life. As a scientist and as an explorer he was superb. The Swan Collection is testimony that he was not much of a prophet. "It is true, however, that the greatest part of this Southern Continent (supposing there is one), must lie within the polar circle, where the sea is so pestered with ice, that the land is thereby inaccessible. The risque one runs in exploring a coast, in these unknown and icy seas, is so very great, that I can be bold enough to say than [sic] no man will ever venture farther than I have done; and that the lands which may lie to the South will never be explored. . . ."
18. AARON ARROWSMITH. Map of the World on a Globular Projection. . . London, 1794 [revised 1799]. The magnificent hemispheres shown on this and the adjoining panel show in detail the routes of the three voyages of Captain Cook. The ice fields and mountains sighted on his second voyage, in which he twice crossed the Antarctic Circle, are carefully noted, but there is no indication whatever of the existence of land in the areas not traversed. Geographic speculation has finally given way to the recording of actual knowledge. 19. JAMES WEDDELL. A Voyage Towards The South Pole. London, 1825. Weddell, an English whaler, sailed towards the Antarctic in 1822 and was able to sail 214 nautical miles farther south than Cook had gone, without seeing ice. He made a number of observations in the sea he discovered which is named for him. 20. BENJAMIN MORRELL. A Narrative of Four Voyages to the South Sea. New York, 1832. Morrell was an American sealing captain who claimed to be the first American to penetrate the Antarctic Circle. Although Nathaniel Palmer, a whaling captain, seems to have been the first, Morrell's interest led him to stimulate Congress into sending an American scientific expedition to the Antarctic and the South Seas. 21. JULES S.C. DUMONT D'URVILLE. Voyage Au Pole Sud. Paris, 1841. From 1837 to 1840 a French scientific expedition sailed to the Antarctic and the South Seas under the experienced and talented Dumont D'Urville. The scientific publications of his previous expeditions had already set a standard of quality which Americans and British sought to emulate in their own work. 22. CHARLES WILKES. Narrative of the United States Exploring Expedition. Philadelphia, 1844. The Exploring Expedition sent out by the United States from 1838 to 1842 was hampered by inexperience and poor equipment. Nevertheless Wilkes charted nearly 1500 miles of the Antarctic coast. The few copies of the twenty or so volumes of the reports of this expedition which were printed were distributed to the various states. This library now holds these volumes on deposit from the State of Rhode Island. 23. SIR JAMES CLARK ROSS. A Voyage of Discovery and Research In The Southern and Antarctic Regions. London, 1847. As the French and Americans had found no approach to the continent the sectors which they had explored, Ross explored another area. The map displayed here attests the importance of international cooperation in these explorations. 24. SIR JAMES CLARK ROSS. A Voyage of Discovery and Research in the Southern and Antarctic Regions. London, 1847. The expedition equipped by the British government and under the command of Ross was, in contrast to the French and American expeditions, intended solely for Antarctic exploration. In two ships, "Erebus" and "Terror," Ross passed through the ice pack to discover the Ross Sea and the mountainous land beyond. 25. VINCENZ von HAARDT. Süd-Polar-Karte von V. v. Haardt. Bremen, 1895. Published on the occasion of the 11th Deutschen Geographentag in Bremen, this elephantine map, scaled 1:10, 000, 000, portrays all of the little which was known of the Antarctic area. Most of the voyages charted on this map had been made long before 1850; however the later ones, including the expeditions of Larsen and Evenson of 1893, are also included. 26. WILLIM GORDON BURN-MURDOCK. From Edinburgh To The Antarctic. London, 1894. Although a number of ships had sailed for the Antarctic after Ross's expedition, it was not until the 1890's that interest was again great enough in the area to organize specific Antarctic expeditions. Like most of the expeditions of the decade, this Scottish one stayed aboard ship and explored the approaches to the continent. 27. [ROBERT N. R. BROWN and others]. The Voyage of the "Scotia." Edinburgh, 1906. The Scots have a separate and special Antarctic tradition which is not very well known and seldom mentioned. Although they did nothing spectacular, they sent several important expeditions south. This is an account of the "Scotia" which under Dr. W. S. Bruce explored unknown areas of the Weddell Sea. 28. FREDERICK A. COOK. Through The First Antarctic Night,	1898-1899, A Narrative of the Voyage of the "Belgica". New York, 1909. The Belgian expedition of 1898-1899 had an international crew. When its ship, the "Belgica, " was trapped in the ice, the expedition was forced to spend a winter on the boat. Dr. Cook played an important role in keeping the crew in health and good spirits. This winter spent in the Antarctic showed that it could be done. --Gift to the Swan Collection of Mr. William L. Putnam. 29. LOUIS BERNACCHI. To The South Polar Regions: Expedition of 1898-1900. London, 1901. Louis Bernacchi was an active explorer and a prolific writer. He participated in several expeditions and wrote about a number of others, helping greatly in making Antarctic exploration popular. 30. CARSTEN BORCHGREVINK. First On The Antarctic Continent. London, 1901. Borchgrevink, a Norwegian, led a British expedition to the Antarctic from 1898 to 1900. He showed that one could spend a winter in the Antarctic in relative comfort and safety. After Borchgrevink there were a number of Antarctic expeditions organized. 31. ERICH von DRYGALSKI. Zum Kontinent des eisigen Südens. Berlin, 1904. In the autumn of 1901 three well-equipped expeditions left Europe for the Antarctic. The German government sent the "Gauss" under Drygalski, a scientist, which concentrated on meteorological and magnetic observations. This book is his account of the German expedition. 32. OTTO NORDENSKJÖLD. Viaje Al Polo Sur. Barcelona, 1904. Although the Spaniard Fernandez de Quiros was the first to search for the Southern Continent, by the twentieth century the Spanish seem to have lost most of their interest in the Antarctic and, judging from the binding of this translation [flamboyant silver-tooled red cloth], we suspect that they do not have much rapport with the spirit of Antarctic exploration. 33. OTTO NORDENSKJÖLD. Antarctica or Two Years Amongst the Ice of the South Pole. London, 1905. A Swedish expedition, organized privately, entered the Weddell Sea and stayed two winters. When its ship was crushed by ice the men were rescued by the Argentine gunboat "Uruguay." 34. ROBERT FALCON SCOTT. The Voyage of the "Discovery." London, 1905. Whereas the German and Swedish expeditions were headed by scientists, the British were led by Commander Scott of the Royal Navy. This expedition was the first to conduct extensive inland exploration. Besides numerous scientific observations, several small journeys and one by Scott of 380 miles were made to explore the interior. 35. ROBERT FALCON SCOTT. Map from The Voyage of the "Discovery." London, 1905. How little was known of the Antarctic in 1905 is suggested by this map of Scott's. The exploratory probes made by this first large expedition to establish itself on the Ross Ice Shelf are here charted. The "Discovery" explored the coast while land parties sought the limits of the ice shelf and went into the mountains behind it. 36. ALBERT B. ARMITAGE. Two Years In The Antarctic. London, 1905. This is a popular narrative of the "Discovery" expedition. Scott's official account, admirably and correctly detached and very detailed, lacked the drama and the warmth supplied by this more personal version. 37. South Polar Times. [1902 - 1905]. To keep up morale during the long and very cold Antarctic winters, the "Discovery" crew prepared a newspaper of poems and stories, drawings, cartoons, and some beautiful water colors by Dr. Wilson. These typewritten sheets, with their illustrations, were carried to England and reproduced in a limited edition for a wider circulation. 38. ERNEST SHACKLETON. The Heart Of The Antarctic. London, 1909. Shackleton, who had become very ill on the "Discovery" expedition and had had to be sent home, surprised everyone, including Scott, by organizing an expedition himself. He found a way to cross the mountain barrier by following a huge glacier--now the Beardmore Glacier--to the Polar Plateau. 39. ERNEST SHACKLETON. The Heart Of The Antarctic. New York, 1909. Shackleton's party turned back from their attempt on the Pole only 97 nautical miles away. "Our food lies ahead and death stalks us behind" wrote Shackleton who, despite many escapes from disaster, returned to the McMurdo Sound base. This book is opened to the description of the last day of the outward trip. "January 9. -- Our last day outwards. We have shot our bolt, and the tale is latitude 88° 23' South, longitude 162° East. ... At 9 A.M. we were in 88° 23' South, half running and half walking over a surface much hardened by the recent blizzard. It was strange for us to go along without the nightmare of a sledge dragging behind us. Homeward bound at last. Whatever regrets may be, we have done our best." --Gift to the Swan Collection of Mr. and Mrs. Stuart C. Sherman. 40. AURORA AUSTRALIS. Antarctica, 1907 - 1908. Shackleton took a printing press with him on his ship the "Nimrod. On this press the party printed a newspaper of a hundred copies which were later bound in wood from the packing crates; our copy is from a case of Stewed Kidneys. . . This first book printed on the Antarctic continent joins this library's copies of the first books printed on the continents of North and South America. --Purchased in part with the gift of Bradford F. Swan. 41. SOUTH POLAR TIMES. [1910 - 1912]. The popular paper of the "Discovery" expedition was revived by the members of the "Terra Nova" expedition of 1910 - 1912. Its editor was young, gay Apsley Cherry-Garrard. Printed later in England and bound uniformly with the earlier Times, it too was distributed in limited numbers. We open the book to a song commemorating the photographer Herbert Ponting. Of his high speed cinematographic ratchet. 42. HERBERT G. PONTING. The Great White South Or With Scott In The Antarctic. London, . Ponting, whose activeness is suggested in the song preceding, took a remarkable series of photographs in the Antarctic. The numerous photographs, the paintings of Wilson, and the great number of books about Scott's last expedition make this the best and most beautifully described polar exploration. 43. THOMAS GRIFFITH TAYLOR. With Scott: The Silver Lining. London, 1916. We open the book to Taylor's description of Cherry-Garrard's revival of the South Polar Times. Taylor was a member of the large scientific detachment with the "Terra Nova." The drama of the Scott polar party can easily make one forget that a great deal of work had been done by members of the expedition before the loss of their leader. "Cherry-Garrard now began his most arduous winter employment as Editor of the South Polar Times. He had brought down a typewriter, and proposed to continue the Antarctic publication, . . . A tin receptacle was nailed under the notice board, and labelled the Editor's Box, and Cherry set to work on his editorial pending the avalanche of contributions. . . ."
44. ERNEST SHACKLETON. Maps and a view from The Heart Of The Antarctic. London, 1909. The central map of the three is the "general map showing the explorations and surveys of the expedition 1907-'09." The flanking maps show in more detail the path of the party which went to the South Magnetic Pole, and the path of Shackleton's party from where it passed Scott's furthest point south to its halt on the Polar Plateau. The panoramas depict the mountainous landscape which the men of the two parties were the first humans to see. 45. ROBERT FALCON SCOTT. Scott's Last Expedition. London, 1914. The notebook written by Scott and the last letters of Scott, Wilson, and Bowers were found with the bodies of the three companions in their tent. We open the book to Scott's last message. of course, and the end cannot be far. 46. APSLEY CHERRY- GARRARD. The Worst Journey In The World. London, . No better description of the finding of Scott and his companions exists than the passage by Cherry-Garrard. We have opened two later editions of The Worst Journey to the pages which contain that passage. Then Atkinson read the lesson from the Burial Service from Corinthians. Perhaps it has never been read in a more magnificent cathedral and under more impressive circumstances -- for it is a grave which kings must envy. Then some prayers from the Burial Service: and there with the floor-cloth under them and the tent above we buried them in their sleeping-bags -- and surely their work has not been in vain. 47. SIR DOUGLAS MAWSON. The Home Of The Blizzard. London, 1914. Mawson played an important part in the scientific work of the Shackleton expedition of 1907 - 1909. From 1911 to 1914 he led an Australian expedition which explored the coast of Wilkes Land. We see how a fellow explorer, who had just lost several men himself, reacted to the news of Scott's death in the passage at which the book is opened. The first news received from the outside world was the bare statement that Captain Scott and four of his companions had perished on their journey to the South Pole. It was some time before we knew the tragic details which came home, direct and poignant, to us in Adelie Land. 48. ROALD AMUNDSEN. The South Pole. New York, 1913. Amundsen, whose intention of being first at the North Pole was thwarted by Peary, had turned his ship south and, using dog teams, arrived at the South Pole a month ahead of Scott. We open the book to Amundsen's account of an anticlimactic finish to a dull trip to the Pole. At three in the afternoon a simultaneous "Halt!" rang out from the drivers. . . . The goal was reached, the journey ended. I cannot say -- though I know it would sound much more effective -- that the object of my life was attained. That would be romancing rather too barefacedly. I had better be honest and admit straight out that I have never known any man to be placed in such a diametrically opposite position to the goal of his desires as I was at that moment. The regions around the North Pole -- well, yes, the North Pole itself -- had attracted me from childhood, and here I was at the South Pole. Can anything more topsy-turvy be imagined? 49. APSLEY CHERRY-GARRARD. The Worst Journey In The World. London, 1922. Cherry-Garrard's own copy of the first edition of his very personal account of his part in the Scott expedition of 1910-1912. The "journey" referred to in the title was made at the depth of the Antarctic winter to obtain eggs of the Emperor penguin. With Dr. E. A. Wilson and Lt. Bowers he sledged in semi-darkness for 140 miles to return with three eggs. 50. APSLEY CHERRY-GARRARD. The Worst Journey In The World. New York, 1923. This is the second edition with a revised preface. The Worst Journey contains a number of illustrations by Dr. Edward Wilson, a companion of Cherry-Garrard. Both companions of this journey, Wilson and Bowers, later accompanied Scott to the Pole; their bodies were found with his in the tent. 51. APSLEY CHERRY-GARRARD. The Worst Journey.In The World. New York, 1930. This is Cherry- Garrard's copy of his book which he used to prepare the Penguin paperback edition shown at the right. The publication of his story in a two-volume and later a one-volume paperback edition, both of which come to us in the Swan Collection, testify to the popularity with which it was received. 52. Records of the Canterbury Museum, 1911. This report on the fishes of the Antarctic waters was obtained by Cherry-Garrard during the expedition and he had it with him on the "Terra Nova," as his signature attests. 53. GERALD S. DOORLY. The Voyages of the "Morning." London, 1916. The "Morning" was the relief ship sent when the "Discovery" seemed icetrapped in 1905. Cherry-Garrard's copy of this book reveals what he thought of Commander Edward Evans. Evans had assumed command on Scottt's failure to return, and although he has been treated gently in accounts of the "Terra Nova" expedition, previously unknown papers of Scott revealed in a recently-published biography of him indicate that he shared Cherry-Garrard's doubts about Evans's abilities. 54. THE POLAR BOOK. London, 1930. This booklet was prepared for the British Polar Exhibition of 1930. Cherry-Garrard contributed to this publication but was obviously unhappy with Dr. Murray-Levick's "Notes on the Rationing of Sledging Parties." Vitamins were quite unknown to the "Terra Nova" expedition and the progressive weakness of Scott's polar party may have had much of its origin in the nutritional value of their rations. 55. "Worcester" Old Boys Association Complimentary Dinner to Rear-Admiral E.R.G.R. Evans. . .
On the back of this menu of the dinner given for Evans of the Scott expedition on March 27th, 1929, Evans made and signed this drawing [of a penguin]. A naval hero in the first world war, Evans became Lord Mountevans, a substantial figure in the English Navy. 56. VILHJALMUR STEFANSSON. The Friendly Arctic. London, 1921. This is Cherry-Garrard's copy which he apparently obtained in 1922. In light of the fact that his own book was written at about the time of his correspondence with Stefansson (at right), this is a most interesting association copy. 57. APSLEY CHERRY-GARRARD. Autograph draft of an unsent letter to Vilhjalmur Stefansson. Written on the reverse side of a letter to Cherry-Garrard from Stefansson and dated August 1st 1923, this very candid reaction was greatly subdued in the version mailed, which is now in the Stefansson Collection at Dartmouth College. The title is frankly an immodest one. I wanted to call it "To Hell: With Scott," but refrained. And when I thought of "Never Again: Scott, some penguins and the Pole" it was objected that it was too much like saying "Christ, some coppers and the Cross." 58. APSLEY CHERRY-GARRARD. Autograph draft of a letter to Vilhjalmur Stefansson. His first draft written and rejected, Cherry-Garrard again tried to answer Stefansson. The sarcasm in this version is more carefully disguised than in the first. This is essentially the text of the letter actually sent. As to the title The Worst Journey in the World may well lie between Picadilly and Harley Street. The Best Journey in the World would have done just as well. 59. SIR ERNEST SHACKLETON. South. New York, 1926. Shackleton decided to return to the Antarctic in 1914 - 1917. This time he was going to try to cross the continent. Sending a party to the Ross Sea to lay out provisions where he expected to end the trip, he entered the Weddell Sea where his ship was trapped in the ice and crushed. 60. ERNEST JOYCE. The South Polar Trail. London, 1929. Joyce was a member of the Ross Sea party which Shackleton had expected to join. When the main party failed to appear, being adrift on an ice floe, the members of the sea party were left to fend for themselves and were forced to usefood which the Scott expedition had left in 1912. 61. RICHARD EVELYN BYRD. Discovery: The Story of the Second Byrd Expedition. New York, 1935. Admiral Byrd's expeditions of the 1920's and 1930's brought about American participation in Antarctic exploration for the first time since Wilkes's expedition nearly a century before. Byrd established several camps, Little America being the most famous, and did most of his exploration by airplane. We open the book to his description of the discovery of Marie Byrd Land. We succeeded in making two successful aerial casts . . . located the Rockefeller Mountains, and . . . northeast along the uncharted coast, yielded up the Edsel Ford coastal range of Marie Byrd Land. I considered the results of this flight far more important than the results of our flight to the Pole. 62. DEAN C. SMITH. By the Seat of My Pants. Boston, 1961. Dean Smith was Byrd's pilot at the time of the "discovery" of Marie Byrd Land. Although he respected many of Byrd's fine qualities, Smith also had some reservations about Byrd's character. We let the viewer judge for himself.
. . . a magnificent solitary Matterhorn of a mountain . . . far out into one of the blank spaces on the map. We kept on as far as we dared . . . told of our flight and our discovery. . .
Byrd spoke very seriously. ". . . I congratulate you gentlemen on confirming my discovery . . . almost exactly the place where I saw it this morning . . . I wanted to be sure before I announced it. Russ, you are authorized to report this to the Times. Please let me check your story before you send it." 63. NATIONAL GEOGRAPHIC SOCIETY. The Antarctic Regions. Washington, 1932. This map reflects the information obtained by Richard Byrd in his exploration by plane. By this time the sector from the Ross Ice Shelf to the South Pole had been mapped to some degree and Sir Douglas Mawson had explored much of the coast, yet a great part of the Continent lay a mystery, and its extent was still undetermined. --Gift of Thomas R. Adams. 64. SIR VIVIAN FUCHS and SIR EDMUND HILLARY. The Crossing of Antarctica. Boston, 1958. The tracks [of sno-cats] on the dust cover of this book exemplify the mechanization of polar research after the second world war. The last great feat of Antarctic exploration and the quest which defeated Shackleton was the' crossing of the continent, a triumph of logistics, intelligence, and equipment. 65. U.S. NAVY. HYDROGRAPHIC OFFICE. Antarctica. Ross Sea - Victoria Land. Franklin Island to McMurdo Sound. From British surveys to 1914 with additions from U. S. Navy expeditions between 1947 and 1959. Washington, 1960. On this map Bradford Swan has indicated the paths of some of his travels the Antarctic in 1960. The land which he saw between Black Island and White Island ("Swan's Neck") has not yet been recognized by the Board of Geographic Names. It is curious that this recent map of an area mapped so often, from Scott, 1902-1905, onward, contains notations of "source material not reconcilable." 66. PEDRO FERNANDEZ DE QUIROS. The Voyages. London, Hakluyt Society, 1904. "Dedication. To Commander Robert Falcon Scott, R.N., M.V.O., F.R.G.S. ; Leader of the National Antarctic Expedition, 1901 to 1904. . . ."
BISHOP JOSEPH HALL. The Discovery of a New World. Cambridge, Mass., 1937. "In Token of the Editor's Respect and Admiration to Richard Evelyn Byrd." We conclude the exhibition with two modern research editions drawn from our own reference collection and (the Hall) from the Rockefeller Library. These editions of early works relating to the Antarctic, dedicated to modern explorers of tile Antarctic, symbolize the combination of tradition and innovation so important in the idea of Antarctic exploration. Brown's copy was purchased at a Sotheby's sale in 1968 for $764.40 (copies recently have fetched in excess of $50,000). (The 1968 date is probably in error as the book was in the above exhibition which was held in 1967.) I first looked at the book on February 11, 1983, and noted the call number or marking in the book as: 68-55 | 8-1-67 | Sothebys | S908 | -B862a. I also wrote down the following: Sothebys 3 + 4 July 68 #198. My second look at it was on May 3, 2002. I noted the call number as D908 | B862a. So there are some inconsistencies. This copy is known as the 'Stewed Kidneys' copy because of the marking on the packing case covers. On the inside front cover appears EWED KIDNEYS. On the inside back cover appears RCTIC 1907. The "many shekels" plate is present. There is no "propeller" in the color illustration on the title page. Rosove 304.A1b. Spence 1095. This copy has no inscriptions or signatures and is in very good condition although with three stains on the front cover and a knot hole on the upper left corner of the back cover. This copy has not been rebacked. UPDATE: The 1967 edition of American Book Prices Current notes a Sotheby's auction on the 3rd and 4th of July, 1967 (not 1968). Lot 198 of that sale (July 3rd) was the Aurora Australis, which went to Maggs at �260. This sale was described as "Americana and books on voyages and travel, atlases and maps...the property of the Earl Amherst, the Royal Cornwall Yacht Club, the Devon and Exeter Institution, Commander W.D.M. Stavely and other donors." The Byrd Polar Research Center Archival Program (BPRCAP) is a collaborative effort of the Byrd Polar Research Center and The Ohio State University Libraries and Archives. Its mission is to collect, preserve, and provide access to historical documents concerned with exploration and investigation of the polar regions. The papers of Admiral Richard E. Byrd are the largest and one of the most prominent collections of the BPRCAP. Comprising more than five hundred boxes, the collection contains documentation of Byrd's five expeditions to Antarctica, to Greenland, and his flights over the North Pole and the Atlantic Ocean. In addition, the collection has materials pertaining to his family and to his participation in public life generally. The Ohio State University acquired the papers from the Byrd family, who desired that the materials be available at a university that had an active scientific program in Antarctica. The Institute of Polar Studies at the Ohio State University changed its name to the Byrd Polar Research Center to honor the explorer. In addition to the Byrd Papers, other prominent collections held by the BPRCAP include the papers of Sir George Hubert Wilkins and the Dr. Frederick A. Cook Society Collection. Wilkins was a contemporary of Byrd's, the first to fly an airplane in Antarctica and the first to take a submarine into the Arctic. Dr. Frederick A. Cook was the first to claim to have reached the North Pole in 1908. The BPRCAP has materials of the Cook Society and of Cook's family and supporters. For the most current information about the collections held by the BPRCAP, as well as other information concerning historical polar research and exploration, please visit the web page at http://www.lib.ohio-state.edu/arvweb/polar. The BPRCAP is located on the western edge of The Ohio State University Campus in a specially designed building. Researchers use a comfortable and secure room to study the collections and exhibits. Library and archival materials are protected in a climate-controlled building where a cooler temperature (55-60 degrees Fahrenheit) and lower humidity (40-45 %) are steadily maintained. The lights in the storage module are low ambient sodium quartz lamps. Books and manuscript materials are stored in acid-free cardboard trays or boxes. This special facility also provides protective storage for the University's archives, its John Glenn archives, and printed materials of the Libraries. --By Laura J. Kissel/Polar Curator, Byrd Polar Research Center Archival Program, 134 University Archives, 2700 Kenny Road, Columbus, Ohio 43210. This description appears on page 126 of "The Magic of Antarctic Colours" by Reinhard A. Krause and Lars U. Scholl. It is used here with Laura's permission. A train ticket issued to Captain Scott in 1910 by the Victorian railways and a rare Antarctic pamphlet organised by Shackleton were purchased by Canterbury Museum (Christchurch) in March from Bethune's auctions in Auckland using the Museum's Miss M C K Richard Bequest. Shackleton's pamphlet The Blizzard was printed for the crew only using articles and sketches unsuitable for the Discovery Expedition's official publication The South Polar Times (1901/2). The pamphlet belonged to dog-handler Isaac Weller and very few copies are known to exist. The pamphlet was bought for NZ$23,625 and is the only one in an Australasian public collection. The train ticket was issued to Captain Scott when the Terra Nova arrived in Melbourne en route to Lyttelton. Scott left the ship for a fund-raising campaign and the Victorian Railways granted him free train travel between 17 and 31 October 1910. This unique ticket was purchased at the auction for NZ $1856. Twelve other Antarctic items were also bought at the auction for NZ$5000. David Stam has written a very interesting paper (presented at the Grolier Club on May 11, 2009) entitled "Bassett Jones, The Grolier Club, and the 1932 Polar Exhibition: Two Thousand Items and Counting." Bassett Jones's collection—Libris Polaris—was purchased by Columbia University in 1944 or 1945. I doubt that it is well known that the Hampshire Record Office Archives of the Hampshire (Winchester, UK) County Council, has a collection of George Marston correspondence, many from or about Shackleton family members. It's online catalogue is at http://www3.hants.gov.uk/archives/catalog.htm. There appear to be 119 separate documents, letters, telegrams and postcards. The entries give some information such as date, addressee, date and occasionally a few details. Description: Correspondence and papers of George Marston, an artist, employed by Sir Ernest Shackleton (1874-1922 see DNB article) on his expeditions to the Antarctic in 1907-1909 and 1914-1916. Includes letters relating to both expeditions, general Marston family letters and some printed material relating to the Antarctic Club and Rural Industries Bureau. AdminHistory: George Marston grew up in Portsmouth and trained to be an art teacher in London. He played a significant role in Shackleton's two antarctic expeditions and illustrated the official accounts. Between the two expeditions he married Hazel Roberts, daughter of Dr Harry Roberts of Oakshott. After the second, famous Endurance expedition, Marston returned to Oakshott and entered a second phase of his life by joining the newly created Rural Industries Bureau of which he became director in 1934. He played a major role in the national initiative to regenerate small rural craft-based industry. He died in 1940. The papers are divided into 3 sections: correspondence, personal and polar printed material and rural industries printed. "The National Library of Scotland has amassed an extensive collection of printed materials on Antarctica and the sub-Antarctic regions, especially with regard to their discovery and exploration. The foundation of this collection is the personal library of Sir James Mann Wordie which was bequeathed to the Library in 1958. (Wordie Collection) The endowment fund granted to the Library by Professor Thomas Graham Brown in 1965 has enabled the Library to continue purchasing in both the mountaineering and polar fields (Graham Brown Collection)." The Library's Mountaineering and Polar Collections are ably described in a section of the Library's website. It's a fine collection of mostly standard works beginning with Cook and Marra and ending with Shackleton and books of that era. There are certainly some treasures in particular a copy of the Aurora Australis, first book written, illustrated, printed, bound and issued in the Antarctic. Among the ephemera are trade cards, menus and lecture programs and quite a few playbills from the Arctic. There's a copy of the very rare Catalogue of the Books of the 'Discovery' which lists the shipboard library of Scott's 'Discovery,' and four volumes of press cuttings relating to Shackleton. The Wordie Collection itself is a important resource. It "was presented to the Library in 1959, it contains over 4,600 printed items, comprising books, journals… c. 2,000 pamphlets, 16 maps, and 68 volumes of correspondence and papers, many concerned with the Colonial Office's Discovery Committee." The Peabody Essex Museum is a splendid institution in Salem, Massachusetts http://www.pem.org. It has an eclectic collection but one traditional specialty is the China trade. One of its Antarctic related treasures is an oil painting of the 'Vincennes,' Lt Charles Wilkes' ship said to have been painted by Wilkes himself. The A. H. Waite Collection (Acquisition 19497) was donated by Waite in 1970. According to John Stewart (Antarctica--An Encyclopedia), "Amory H. 'Bud' Waite was one of the 3 who rescued Byrd in 1934, during Byrd's 1933-35 expedition. He took part in Operation Highjump, 1946-47, and during IGY (1957-58) was leader of the US Army Signal Corps Antarctic Research Team. He was communications specialist on the 'Atka' during the US Navy Antarctic Expedition of 1954-55, and on the USN Bellingshausen Sea Expedition of 1959-60." Note: Some items have not been included as they are exclusively of arctic or other interest. Some corrections have been made to obvious typographical errors. M-14344. 1 dog harness 35" long from Admiral Byrd's Antarctic Exped. #2 1933-35. M-14347. Antarctic typical black flag used by present day Ant. Expeditions. M-14348. Ant.-typical orange flag use by present day Antarctic Exped. M-14349. Ant. tin can containing eskimo biscuits from Scott's & Shackleton's Ant. camp 1902-7, recovered by A.H. Waite 1958-1962 7" diam 4-1/2" high. M-14365. Ant.- fragment of bottle glass, an old belt buckle, a handmade hinge, a tin can cover nad 6 nails. The glass fragment, buckle, and hinge were found at a campsite on the Northeast coast of Greenland. The tin can cover is from Etah, Greenland and the 6 nails came from Scott's base in the Antarctic. M-14369. Ant.-tin of waterproof matches recovered from Shackleton's 1907 house. M-14376. Ant- boot strap from Scott's 1910 house. M-14377. Ant.-fragment of a sled rope found in Scott's 1910 house 7" long. M-14378. Ant.-spool of thread found at Shackleton's house, originally made in England before 1907. 2" spool. M-14379. Ant.-spool of thread with a needle in it from Scott's 1910 house. 2 " spool. M-14383. Ant.-ski strap found at Scott's base 21 " long. M-14384. Ant.-staple from one of the ship riggings from Cape Royds, which was Shackleton's. M-14385. A piece of the figurehead of the ship BEAR, brought back by Admiral Byrd in 1935. 11-1/2" long (this piece fits exactly with M-4396). M-14411. Ant. -Box kite used by Admiral Byrd on his first Antarctic Expedition and repeated on his second expedition. It carried antenna wires aloft for better radio transmissions. . later proved unneccessary (dismantled). Plymouth City Museum and Art Gallery has strengthened its collections of Antarctic material following its success at two recent auctions. With funding support from the MLA/V&A Purchase Grant Fund, the Museum has acquired items relating to two crew members who sailed with Plymouth born Antarctic explorer Captain Robert Falcon Scott. One item is a photographic album belonging to Patrick Keohane who served as a Petty Officer on the 'Terra Nova' Expedition of 1910-1913. The photographs reveal fascinating glimpses of everyday life on the expedition. The Museum has also acquired a collection of items celebrating the life of Fred E. Dailey. Dailey was a carpenter on the 'Discovery' Expedition of 1901-1904. His collection includes portraits of Dailey, his Certificates of Discharge and a set of miniature medals � including his Antarctic Medal and a Distinguished Service Cross awarded during the First World War. Both Keohane and Dailey have close links with Plymouth. On first joining the Navy, aged 16, Keohane was stationed at Devonport. He later retired to the City. Dailey came to Plymouth to serve his apprenticeship as a carpenter in the Dockyard and his family settled here. He is buried at Ford Park Cemetery. Jonathan Wilson, Collections Manager, said "We are thrilled to have been able to purchase these items. The acquisitions are an excellent complement to the items we already hold in our collections. They will help us to better highlight Plymouth's Antarctic connections and celebrate the great 'heroic age' of exploration in future exhibitions." Existing collections at the Museum include Dailey's letter of appointment, signed by Scott and a model of the 'Terra Nova' made by Keohane. Plymouth's set of 'Scott's Skis' were given by Scott to Keohane - who later passed them to the care of the City. A selection of the newly acquired items will be put on display at the Museum during Spring 2007. Plymouth City Museum and Art Gallery is open from 10am-5.30pm Tuesday to Friday and 10am-5pm Saturday and Bank holiday Mondays. Admission is free. For more information visit www.plymouthmuseum.gov.uk, call 01752 304774 or send an email to enquiry@plymouthmuseum.gov.uk. Please check in advance if you are making a special journey to view specific exhibits or displays or attend a specific event. ARCHIVES of the SCOTT POLAR RESEARCH INSTITUTE, Cambridge, UK. ARCHIVES HUB: A PROGRESS REPORT Friends will know that the Institute possesses a matchless Archive but how do you know exactly what is in it? Up until now, you will have been referred to the catalogue of manuscripts compiled in 1982 by then Archivist Clive Holland. This is a wonderful work of reference but SPRI has received many collections since and, of course, not every library has a copy of Clive's catalogue. Soon you will be able to use the Internet to see descriptions--not yet the originals of our very extensive Antarctic collections. The Arctic collections will follow so long as we are successful with our application to continue the project. The work is being carried out by Naomi Boneham, Assistant Archivist, with the help of Rebecca Stancombe, Librarian's Secretary. To see the SPRI holdings, enter the Archives Hub home page (www.archiveshub.ac.uk/). Here you will read the Hub's description of itself as "A national gateway to descriptions of archives in UK universities and colleges". UK universities and colleges is underlined. Click on this and you will see the option Browse repositories: Select one.... Click on the down arrow and look for Cambridge: Scott Polar. Select this. [You will then see an underlined link: Browse Scott Polar Research Institute's descriptions. Click this and you will come to a listing of individual collections. Here you can either go to the full description or a summary.] At the time of writing (March 2003), Naomi has created 500 descriptions of which 59 have been loaded onto Archives Hub. More descriptions will follow at a rate of 30 per week, or as many as the Hub staff can handle. Our target for the end of the first year (August) is 1,000 descriptions. If we succeed in this, it will mean that the Antarctic entries are virtually complete. Rebecca's task has been to write brief biographies for the many individuals represented in the collections. As you may imagine, some of these are well-known, while others are obscure. The biographies alone will be a valuable resource, often the only reliable source of information for these persons on the Internet, while Naomi's descriptions of the collections should transform the means by which historians of polar science and exploration pursue their research. If you would like to know more about this project, please contact me by letter or e-mail (wjm13@cam.ac.uk). This is a VERY SIGNIFICANT step and William, Naomi and Rebecca are to be congratulated. As of today (18 April 2003) the number of records stands at 112. Far more information is included than in Holland's catalogue (see below). As William points out the biographies will prove to be very useful. The record titles are displayed in batches of 50. One has the option of either getting a summary or the full description (as a sample I've appended below the full description of the Albert Armitage collection). The records are not arranged in any discernible order although it's noted that they are "listed in order of relevance." One can search within the SPRI portion of the 'Archives Hub', but nonetheless it would be more useful to have the records arranged alphabetically by name. Let's hope that SPRI's artifact collection will be similarly available on-line soon. Clive Holland's catalogue remains useful, of course. It's long out-of-print and it's not easy to find a copy. It was published by Garland Publishing, Inc., New York and London, in 1982. The full title: Manuscripts in the Scott Polar Research Institute, Cambridge, England. Edited by Clive Holland. 815 pages. It includes an extensive 'Index of Expeditions and Yoyages.' Despite the title some of the material included is at other institutions. Extent: Expedition material and correspondence. Albert Borlase Armitage was born in Scotland on 2 July 1864. He had been working for P&O for eight years when, in 1894 he joined the Jackson-Harmsworth Arctic Expedition, 1894-1897 (leader Frederick George Jackson) to Franz-Josef Land. Armitage was appointed second in command. The expedition lasted three years and Armitage took part in all the major sledging journeys. He conducted out a series of physical observations having undertaken training in meteorological and magnetic equipment prior to the expedition. His experience gained him a place on the British National Antarctic Expedition, 1901-1904 (leader Robert Falcon Scott). Again he was appointed second in command and navigator on the Discovery . He led the first sledging party to penetrate and reach the Polar Plateau. After returning from Antarctica he worked his way up through the ranks of the merchant navy to become Commander of P&O Steam Navigation Company. He continued to write and lecture on polar exploration, while remaining in contact with polar explorers. He died on 31 October 1943. The collection comprises of material relating to the Jackson-Harmsworth Arctic Expedition, 1894-1897 (leader Frederick George Jackson), the British National Antarctic Expedition, 1901-1904 (leader Robert Falcon Scott) and correspondence by Armitage. The collection is split into three sub-fonds covering the Jackson-Harmsworth Arctic Expedition, 1894-1897 (leader Frederick George Jackson), the British National Antarctic Expedition, 1901-1904 (leader Robert Falcon Scott) and correspondence by Armitage. Copying material by photography, electrostat, or scanning devise by readers is prohibited. The Institute may be able to provide copies of some documents on request for lodgement in publicly available repositories. This is subject to conservation requirements, copyright law, and payment of fees. The term holograph is used when the item is wholly in the handwriting of the author. The term autograph is used when the item is signed by the author. The Jackson-Harmsworth Arctic Expedition, 1894-1897 (leader Frederick George Jackson) spent three years in Franz Joseph Land. Sledging expeditions were undertaken and the expedition met the Norwegian North Polar Expedition, 1893-1896 (leader Fridtjof Nansen) on 17 June 1896. The collection relates to Armitage's work during the expedition. See SPRI collections GB 0015 Reginald Koettlitz and GB 0015 William Speirs Bruce for additional archival material held by the Institute relating to this expedition. There are several archival collections held by the Institute regarding this expedition which it is hoped will be made available on the HUB in due course. Extent: 6 volumes (2 journals, 3 workbooks, 1 notebook), 7 reports, 1 order, 67 leaves. Many of the items are in bound volumes. MS 641/8;MJ and MS 641/11;MJ are on microfilm. The British National Antarctic Expedition, 1901-1904 (leader Robert Falcon Scott) undertook the first extensive exploration on land in Antarctica. Funding came from the Government, the Royal Society, the Royal Geographical Society and private donations. The expedition set up base at McMurdo Sound from where sledging parties carried out recognisance and scientific programmes. Scott made the fist balloon ascent on the continent in 1902. A three-man sledge party consisting of Scott, Ernest Henry Shackleton and Edward Adrian Wilson achieved a furthest south of 82.28� on 30 December 1902. The expedition ship, Discovery , commissioned and built especially for the expedition was beset in McMurdo Sound from 1902-1904. See SPRI collection GB 0015 British National Antarctic Expedition, 1901-1904 for a fuller list of archival collections held by the Institute containing material on this expedition. Extent: Circa 26 letters. MS 641/3;MJ is on microfilm. The correspondence covers both the Jackson-Harmsworth Arctic Expedition, 1894-1897 (leader Frederick George Jackson) and the British National Antarctic Expedition, 1901-1904 (leader Robert Falcon Scott) and subsequent correspondence. See separate sub-fonds for expedition material. 'FREEZE FRAME,' SCOTT POLAR RESEARCH INSTITUTE, Cambridge, UK. "The collections held by the Scott Polar Research Institute, University of Cambridge, are among the richest in the world for the study of polar environments. Work begins in April 2007 on the Freeze Frame project to capture and preserve our archive of historical images in digital form. Our photographic negatives are a unique resource but also an extremely fragile one. We will digitise over 20,000 photographic negatives from 1845-1960, representing some of the most important visual resources for research into British and international polar exploration. Digitisation of related documents - information from personal journals and official reports from expeditions on which these photographs were taken - will provide historical and cultural context for the images. We also intend to add context to the images by displaying them alongside selected items from our pre-eminent collection of polar fine art, prints, drawings, and manuscript materials. The Freeze Frame project aims to develop an online database of freely available visual and textual resources to support learning, teaching and research into topics relating to the history of Arctic and Antarctic exploration and science. Through a series of interpretative web pages and e-learning resources the project will provide access to hidden collections for all educational levels. We will encourage users to discover polar environments through the eyes of those explorers and scientists who dared to go into the last great wildernesses on earth." "For enquiries about the project or to be added to the project's mailing list please email museum@spri.cam.ac.uk or contact Heather Lane. We will be placing a call for participants in an online Collection Development Forum in November - please register your interest." Thomas Griffith Taylor was a member of Scott's Terra Nova expedition and later led a distinguished career as a geographer. (See Wikpedia.) He married Raymond Priestley's sister. "The Griffith Taylor Collection consists of original letters, journals and sketches, copies of publications, various items of equipment and some geological specimens originally given to the Department of Geography (in 1960) by Professor Thomas Griffith Taylor." The collection now resides in the University of New England's Archives located in the Heritage Centre. A listing of the collection has been provided by the University. Among the important items is a copy of the Aurora Australis, photographs, a Wilson pencil sketch done at Cape Evans, Taylor's wind-proof helmet, various journals and sledge diaries and letters to and from Scott, Bowers, Priestley, Bruce, Charcot, Filchner, J.K. Davis, Edgeworth David, von Drygalski, etc.